Distinguished human rights lawyers and legal campaigners - Gareth Peirce, Alistair Logan and Linda Weil-Curiel - attended this year’s Inspired by Law gallery and awards ceremony on Tuesday 21 February at London South Bank University (LSBU). The event honoured their lifetime contribution and that of their peer group, to the human rights legal profession, the rule of law and the promotion of social justice. 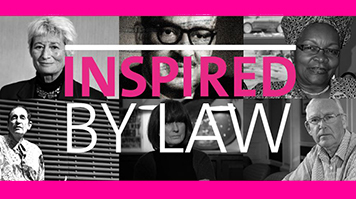 Now in its second year, Inspired by Law is an annual event at which LSBU law students present reasoned nominations for their choice of inspiring lawyers, who are then shortlisted for the gallery and invited to attend the awards ceremony. On the night, each of the lawyers chosen was introduced by their nominating student, followed by a panel discussion on the important themes raised by the gallery. Emergent and recurring themes included miscarriages of justice and the demise of the Forensic Science Service; the refugee crisis in Europe and the USA ban on Muslim migrants; the prevention and punishment of crimes of Female Genital Mutilation and Forced Marriage; and the promotion of LGBT rights in Africa and beyond. Alan Birbeck, LLB Course Director and the Inspired by Law Project Secretary said: “LSBU’s Law Division is a Community Law School committed to the promotion of human rights, the rule of law and social justice, through its teaching, research and engagement with the local and international community. Claire Hood, CPE Graduate and the student who nominated Gareth Peirce, said: "Being a mature student and hailing from a working class background, I had laboured under the misapprehension that a legal education and subsequent career was beyond what I could hope to achieve. But after I attended last year’s event and during the preparation for this year, I came across many people who have struggled in the face of extreme adversity to achieve what at first had seemed impossible. This has inspired me to carry on in my quest to become a legal professional." Learn more about them on the Inspired by Law page.